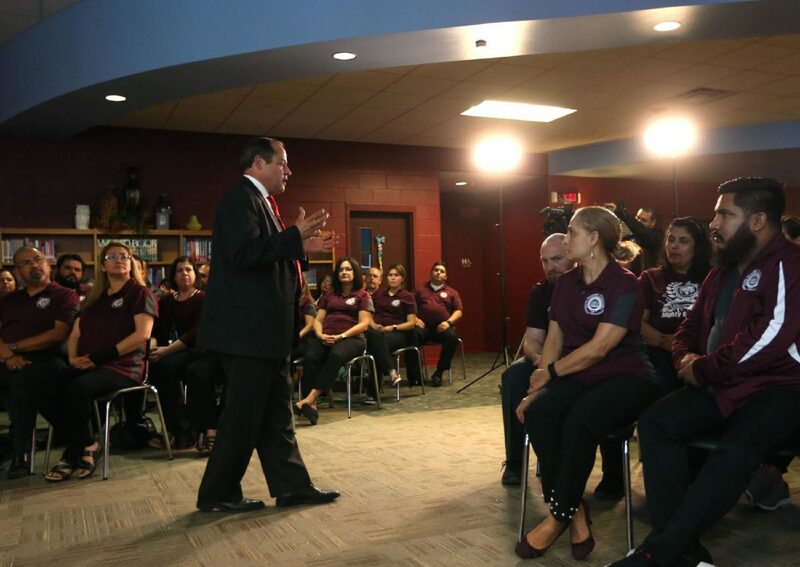 PSJA ISD Superintendent Daniel King presents his charter proposal to teachers and other administrators earlier this year. PHARR — With a few days left before teachers are asked to vote on a plan to adopt a plan that could give their campuses some charter-school-like qualities, Pharr-San Juan-Alamo school district Superintendent Daniel King released more details. “Your interest, questions and concerns have been invaluable in informing me in this process and helping me fine tune the proposal,” King wrote in a notice sent to teachers and staff on Tuesday. The letter included a link to the updated draft of a contract with what he calls an Innovative Management Organization, or IMO, which as per Senate Bill 1882 could allow the district to receive additional funding. King has referred to the proposal as a way to merge the benefits of having charter status with the current public school system. The law requires maintaining Chapter 21 and 22 contractual protections for teachers, as well as that districts employ certified teachers and staff and that they serve all students living in their coverage area. In order to achieve a middle ground, King proposes holding the IMOs responsible not for fully running the campus but for creating methods in which teachers and staff are more involved in the decision making of their campuses, he said. “The district wishes to further innovate by creating a new partnership model that is founded on the strengths to traditional, democratically elected Board of Trustees, while providing increased flexibility and innovation by supporting increased autonomy through partnering with a nonprofit (IMO) whose primary purpose is to support the strategic and responsible use of empowerment of campus staff along with the responsibility for achieving results.” the IMO contract draft states. If this was to be a district-wide change, King said the plan would be to partner with 5-7 IMOs led by local education leaders to serve a cluster of campuses each. King proposed having the individuals vetted by a committee of teachers and district administrators and paid using the extra funds, which they estimate would total about $906 additionally per child, per year, or $28 million annually if it’s a district-wide move. But as per the contract the IMOs will be also overseen by its own governing board that will operate as a separate entity from the district. The board will have the “exclusive authority” to hire and oversee the IMO executive director and to set their employment terms and conditions. Some of the concerns echoed throughout the district include teachers being asked to vote without knowing who the IMO board members will be, as well as the differences between King’s proposed contract and the Texas Education Agency’s rules for the adoption of the bill. Some of these rules state the partnering entities would have sole control over campus operations, including hiring and firing. But the draft also states that while they will have sole control over operations, the IMO decisions are subject to limitations of the agreement. “IMO elects to operate in accordance with all current or future PSJA Board Policies unless specifically exempted,” states the contract. Even as King said he plans to only implement the bill if TEA approves it as is, some fear their vote in favor could open the door to other changes. Implementation of the bill, however, does not require approval by teachers and staff, as the bill only asks for these parties to be consulted. But as yet another difference, King said he committed to only implementing the bill at campuses where the majority of teachers vote in favor. The vote is scheduled to take place Thursday for which King proposed having anonymous ballots that would be counted in front of teachers to validate the process.